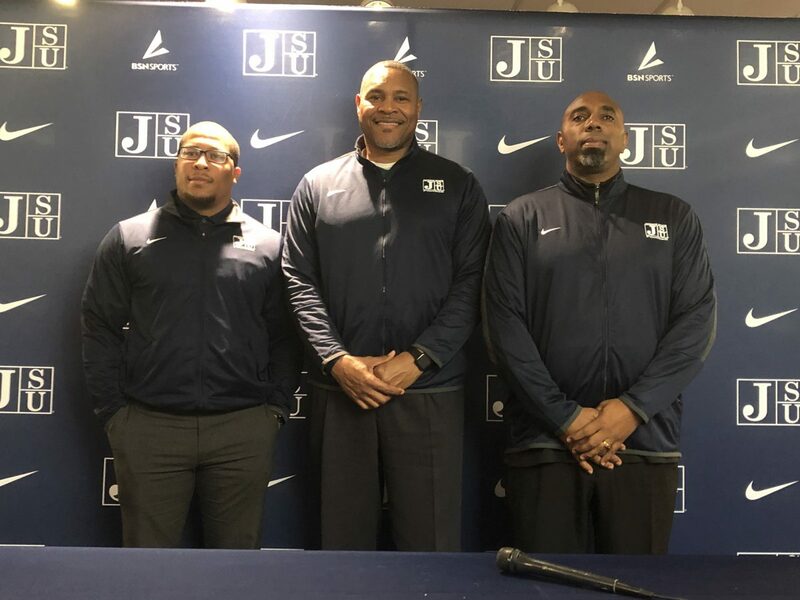 Jackson, MS – Shortly after then Jackson State interim head coach John Hendrick became the head coach in December, he wasted no time putting together a new staff of assistant coaches and coordinators ahead of the 2019 season. When spring football starts, there will be lots of new faces under Hendrick, along with some familiar ones. From left to right: Defensive coordinator Lionel Stokes, Head coach John Hendrick and Offensive coordinator Ron Dickerson Jr.
Offensively, Ron Dickerson Jr will serve as the offensive coordinator. Along with Dickerson, former Tigers standout T.C. Taylor will serve as the wide receivers’ coach, William Robinson will serve as the running backs coach, Otis Riddley will serve as the offensive line coach and Brady Ackerman will be the wide receivers’ coach after serving as the Tigers offensive analyst. Defensively, Lionel Stokes will serve as the defensive coordinator. With Stokes, Dorsett Davis will serve as the defensive line coach, Charles Mitchell will oversee the safeties, Dwayne Curry will serve as the linebackers’ coach and Medgar Harrison as the strength and conditioning coach. Hendrick said he is excited about new coordinators who will help take the Tigers program to the next level. “Ron and Lionel Stokes, they are both good men and smart, cerebral guys,” Hendrick said. At many times during the 2018 campaign, JSU struggled offensively and relied heavily on its rushing attack to get the bulk of its yards on offense, negating the passing game when teams denied the Tigers the opportunity of a consistent running game. Jackson State finished ninth in scoring offense (16.5 points per game) in the Southwestern Athletic Conference, eighth in total offense (276.1 yards per game), seventh in rush offense (117.3) and last in pass offense (158.8) last season. As Hendrick searched for an offensive coordinator, he simply wanted a coordinator who could get first downs. “I wanted a guy who could throw the ball when we needed to throw the ball, run the ball when we needed to run the ball and get first downs,” Hendrick said. Dickerson is up for the challenge of leading the Tigers’ offense to earn those first downs. Before assuming his role as the Tigers offensive coordinator, Dickerson spent the past 11 years working in different coaching capacities that include serving as the special teams and wide receivers coach at Morgan State as well as other stops at Ole Miss, Louisiana Monroe, Missouri State, and Alabama State. Dickerson, who was a big Walter Payton fan, said the most exciting thing about his new role is the rich tradition within the football program. “When you talk about the rich tradition, it’s here,” Dickerson said. Under Dickerson, as far as offensive schemes, the Tigers’ offense will come from the West Coast but they will also run the spread and the run-pass option. More importantly, establishing an “identity” on offense moving forward will be the key to the Tigers’ success. “At the end of August, our young men will be able to name the offense because it is going to be their offense,” Dickerson said. For Dickerson, moving the chains for first downs should be a lot easier with the addition of quarterbacks’ coach T.C. Taylor, a former JSU quarterback and wide receiver from 1998 to 2001. The McComb, Miss., native played two-and-half seasons at quarterback before switching to wide receiver, making a huge impact at the position. In only 19 games as a wide receiver, Taylor recorded 188 catches for 1,793 yards and broke the single-season record with 84 receptions for 1,234 yards as a senior. After his brief stint in the NFL, Taylor began his 13-year coaching career at Coahoma Community College, where he served as the offensive coordinator, wide receiver and quarterbacks coach during his tenure. Taylor, then, made stops at Texas Southern (wide receivers, wide receivers recruiting coach) and North Carolina Central, where he most recently served as the offensive coordinator of a unit that averaged 26.8 points per game and 268 yards of total offense per game. Dickerson said having Taylor as part of the Tigers coaching “family” is like the spike to the oil. “He is the heartbeat to this campus. He knows the heartbeat to this university,” Dickerson said. The quarterback position plays an integral part in the offensive production. For the Tigers, the level of play from its signal callers in recent years has not been the same in comparison with other decades, something Dickerson and Taylor hope to change in the upcoming season and moving forward. With five quarterbacks on campus, Dickerson said there will be great competition. “Competition is everything,” Dickerson said. Defensively, Stokes – who is only 28 years old – is originally from Columbia, Mississippi. Before spending the last two seasons at JSU as the defensive backs coach, Stokes worked at Louisiana Lafayette – his alma mater – as the linebackers’ coach. “He understands our system and how we coach the guys,” Hendrick said. Although young in age, Stokes said he is excited about the opportunity but knows he has big expectations to live up to. As a defensive unit, JSU finished third in scoring defense (giving up 24.5 ppg), second in total defense (353.9 ypg), second in rush defense (144.7 ypg), fifth in pass defense (209.2 ypg) and defensive efficiency (121.8). Only time will tell just how much the Tigers have improved on offense and defense as spring football vastly approaches in the coming weeks.